In the case of movies, you can either rent or buy content. If you rent, which is less expensive but makes the content yours for only a short time, you have 30 days from the time you rent the item to begin to watch it. 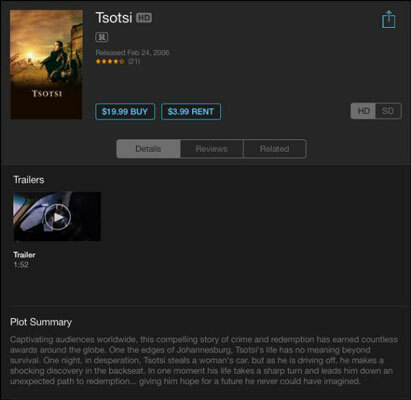 With the iTunes Store open, tap the Movies button. Locate the movie you want to rent and tap to open it, as shown. The Rent button changes to a Rent Movie button. (See the figure.) At this point, you may be asked to enter your Apple ID and password. Tap the Rent Movie button to confirm the rental. The movie begins to download to your iPad immediately, and your account is charged the rental fee. To check the status of your download, tap the Downloads button. The progress of your download displays. After the download is complete, you can use either the Music or Videos app to watch it. Some movies are offered in high-definition versions. These HD movies look great on that crisp, colorful iPad screen, especially if you have a third-generation (or later) iPad with Retina display. It’s best to download these over a Wi-Fi connection, as a 3G/4G connection could incur hefty charges. You can also take content that you’ve downloaded to your computer and sync it to your iPad.